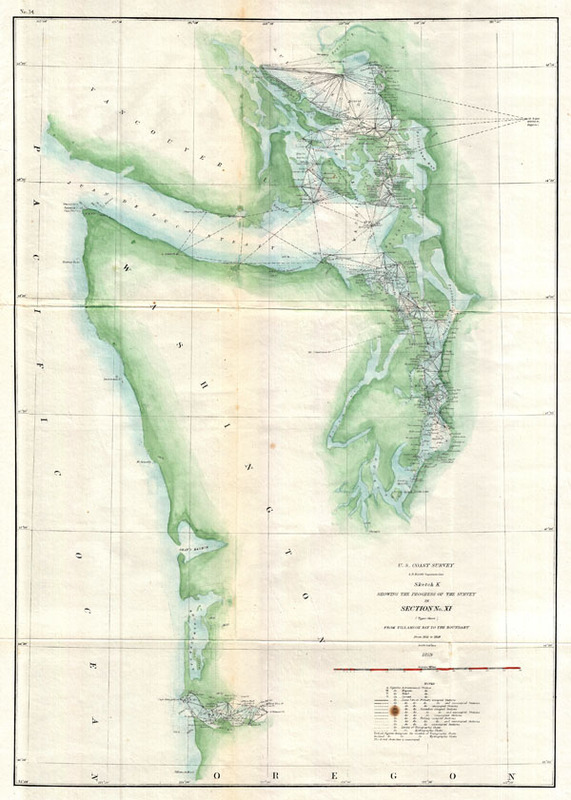 One of the Coast Survey's earliest mappings of the Puget Sound. Sketch K Showing the Progress of the Survey in Section No. XI (Upper Sheet) from Tillamook Bay to the Boundary. A delicately hand-colored 1859 US Costal Survey map or triangulation chart of Washington State from Tillamook Head to Vancouver Island, including Juan De Fuca Strait, the Puget Sound, Olympia, and Seattle, with numerous triangulation lines. Produced under the supervision of A. D. Bache, one of the most influential directors of the U. S. Coast Survey. Very Good. Minor verso reinforcement on original fold lines. Minor discoloration in lower left quadrant, beneath mile scale.